The original recording that the Metal Machine EZX was based on. 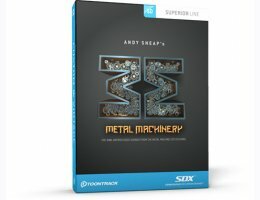 This SDX expansion for Superior Drummer 2 features the original recording that was used as the foundation for arguably the most popular set of metal drum sounds on the market; the Metal Machine EZX. What makes it different from the EZX version is that the SDX sounds are raw and without post-processing, meaning the source material recorded directly at the studio. It comes with fundamentally the same collection of instruments but includes a wider variety of mic selections as well as a custom bank of kit presets. The sessions were conducted at Studio B of Los Angeles’ Henson Recording Studios. Formerly known as the A&M Studios, these landmark facilities have housed the who’s-who of the recording industry of the past few decades. Heavy acts like Metallica, Soundgarden, Kiss, Pearl Jam and many others have all mixed or recorded groundbreaking works here. At the helm recording, a man that needs no introduction to the world of metal; Andy Sneap. Having produced and mixed defining albums by some of modern metal’s most priced acts like Testament, Megadeth, Accept and Killswitch Engage, Sneap has had an instrumental role in shaping the sound of metal as we know it in the new millennium. This library comprises three full kits, a wide assortment of cymbals and a total of seven snares drums, all recorded using the utmost in recording equipment. With its concrete-lined walls, the room at Studio B produces a hard but still deep and precise tone, making it a perfect sonic environment for big, reverberant rock and metal drums. This room really brings out the very essence and raw nature of these instruments. This is more than a collection of drums for just rock and metal. With the powerful tools of Superior Drummer 2, it’s a clean canvas of the finest of raw material, ready for you to harness, shape and mold into something truly unique. A working EZdrummer version 1.3 or a Superior Drummer 2.3 (or above) installation. 4GB free hard disk space, DVD drive (25GB free hard disk space for full installation). MIDI controller such as keyboard, drum pads or electronic drum kit recommended.